The stock Music app on the iPhone, iPad, and iPod Touch is the preferred music player for iOS because of its simplicity, design, and ease of use – but while Music is great for playing songs, it doesn’t include a method for sharing the song you’re listening to. 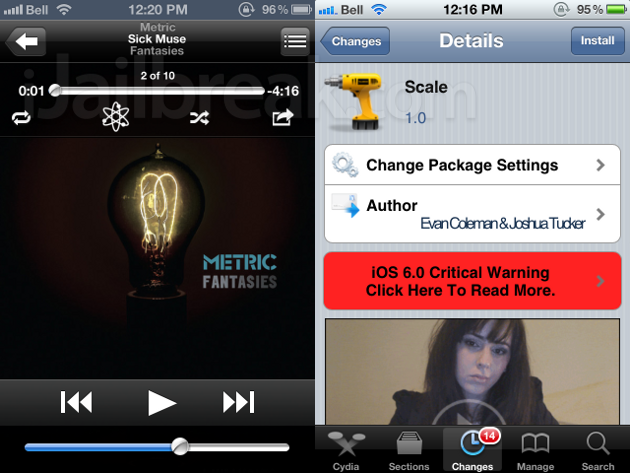 Scale takes what’s great about the default music player and makes it social. How does Scale make the music player social? The tweak adds an unobtrusive options button on Music’s Now Playing screen. Press the button and you are presented with a list of methods for sharing your current track. The sharing options include Email, Message, Tweet, and, if you are using a jailbroken version of iOS 6, Facebook. These options, along with Copy (to clipboard) will allow you to quickly share the message “I am listening to [Track] by [Band].” It’s not quite as convenient as a YouTube link, but it should make your recommended tracks easy enough for your friends to find. Scale could have stopped with the social sharing feature and still be a solid tweak, but Scale goes even further. The options menu also includes a new Add to Playlist button. If you’re listening to a song you like, you can instantly add it to a favorites playlist from the Now Playing screen. This feature alone makes scale a must-have tweak. The only negative comment I could make about Scale is the lack of Facebook sharing in iOS 5. While this is understandable because the tweak plugs into iOS’ built-in features, the direct share link to Facebook is currently only available on the buggy tethered jailbreak available for the iPhone 4, 3GS, and 4th generation iPod Touch. That’s a bit of a disappointment. An example of Scale’s sharing functionality. Scale is one of the three big Cydia tweaks that launched at the World Wide Jailbreak Conference, alongside Emblem and Merge, and is now available to download. You can find Scale FREE in the BigBoss repository on Cydia. There are no settings to configure. Since we’re in a sharing mood, what are some of your favorite songs? Share your thoughts in the comments section below.